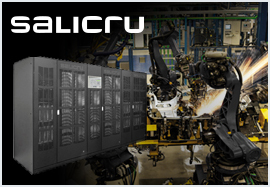 In recent months, Salicru has supplied several high-power devices to companies in different industrial sectors but with the same common need: the availability of a superior electrical protection system to ensure the proper functioning of all of their facilities and the continuity of their production processes. In the first case, two UPSs from the SLC XTRA series, with power ratings of 800 kVA and backups of 30 minutes, have been installed in the facilities of the company INACSA (Industrias del Acetato de la Celulosa) in La Batllòria-Sant Celoni, Barcelona, with the purpose of protecting its production processes. In the second case, for the company ENCE (Energía y Celulosa) in Pontevedra (Galicia-Spain), two modular UPSs from the SLC Adapt series, with power ratings of 300 kVA and 10 modules of 30 kVA each, have been installed with the aim of protecting its production processes. And lastly, for a prestigious Spanish engineering company specialising in the construction of pharmaceutical plants, a voltage stabiliser from the EMI3 series with a power rating of 1,300 kVA has been installed in its latest project in Algeria in order to protect its facilities from the frequent voltage fluctuations that occur in the power supply.